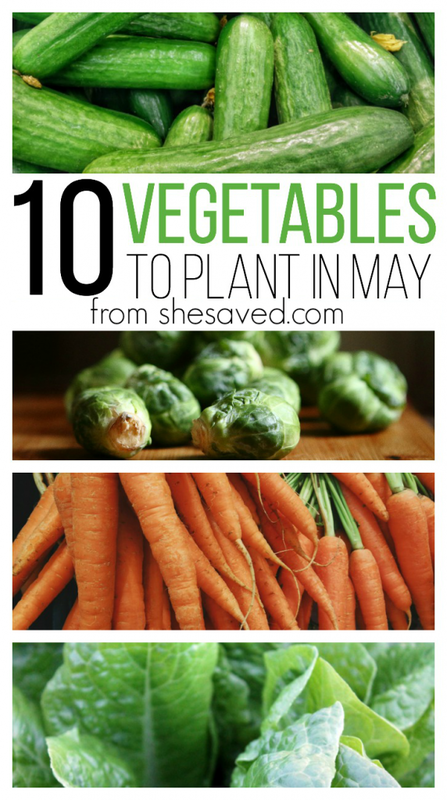 If you are making gardening plans and deciding on which foods you will be growing this year, now is a good time to decide which vegetables to plant in May. Some produce needs the warmer soil, so all frosts should be over before planting most of the ten vegetables below. Hopefully, this list of vegetables will help you plan and manage an abundant garden bursting with food come harvest time! 1. Brussels Sprouts – Though these veggies should be planted in the garden in May, they need to be planted in cooler areas. Too much heat, and the sprouts will bust open and be floppy. Space the plants 18-24 inches apart for best results. 2. Summer Squash – Before planting summer squash, be sure to mulch and raise the area. The squash requires very moist soil in order to grow well. Harvest time is short compared to other May vegetables, with the summer squash being ready within 7 to 8 weeks. 3. Carrots – Carrots are some of the easiest vegetables to grow. You can’t really plant these at the wrong time, as long as you do so when the soil temperature is 50-80 degrees. Place carrot seeds about 6-10 inches apart. If you have a successful crop, make sure to check out my Glazed Carrots with Dill recipe, it’s a favorite around here! 4. Celery – Transplant the seedlings of celery to the garden in May to have a wonderful harvest 18 weeks later. Be sure to keep the soil moist when growing this vegetable. You may lift the celery plants if needed after 11 weeks. 5. Potatoes – Ensure the potato area of your garden is dug with lots of rotten compost before planting. Fill the bottom of your trenches a little extra compost for good measure. Keep the soil around the potato plants moist. Give them 15-20 weeks to harvest. 6. Radishes – Radishes are great for beginning gardeners to plant in May. They don’t require much maintenance and are ready for harvest in 5 to 7 weeks. Sow radishes between other plants to easily mark rows in your garden. 7. Eggplant – It’s time to transplant the eggplant seedlings in May. Space each plant about 25 inches apart. Harvest time for eggplant is 12 to 15 weeks. 8. Lettuce – Another easy veggie to grow, lettuce seeds or seedlings need to be put in the garden in May. Be sure to leave 10-12 inches between each plant. Since they are shallow rooted, lettuce plants need frequent watering, especially in dry or hot climates. 9. Asparagus – I shared with you my 7 Top Tips for Growing Asparagus a couple of weeks ago, and this is definitely a plant that you will want to get in the ground in early May. This one is a bit trickier though and go into it knowing that your first year (or two) won’t yield a huge crop but it will pay off years down the road! Once you perfect your asparagus growing skills, make sure to check out my Easy Over Roasted Asparagus recipe! 10. Cucumbers – A little different from the other vegetables to plant in May, you might want to use a trellis to grow your cucumbers. We have grown them both ways and I do have to say, a trellis will help clean them up a bit and make them easier to harvest. The soil needs to be kept moist, but cucumbers are fairly low-maintenance to grow. Harvest is generally 8 week after planting. « Mugs Make a Great Mother’s Day Gifts!